Many college-bound students will find that they need to take out one or more private lender loans to help them complete their education. Scholarships, grants and Federal loans only go so far, and private lenders offer a way for cash strapped students to find the money they need to make college a reality. Unlike Federal students loans, however, private lenders issue loan agreements strictly on the basis of credit history. For many students, this can present a problem. The majority of college-bound students, particularly those fresh out of high school, will have built up little or no credit history. Worse, they may be stuck with a poor credit report that may stifle their chances of securing the necessary student loans to pay for college. The following are some of the most frequently asked questions concerning private lender loans and students with bad, or nonexistent, credit. Q : How do I know if I have bad credit? A : If you have defaulted on a loan in the past, or if you have had a legal judgment against you concerning unpaid rent, utility bills or traffic tickets, chances are you are stuck with a bad credit report. Many free services can be found on the internet that will supply you with an up to date evaluation of your credit score, which will give you a good idea of the current status or your credit and your ability to qualify for a student loan. Q : Are there special programs for students with bad credit? A : Unfortunately, private lenders do not offer special programs for students with bad credit. All lending companies utilize the same basic criteria when determining a person’s eligibility for any loan. 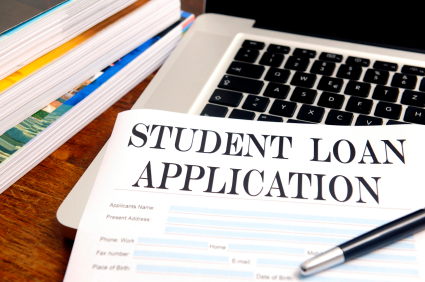 Banks and other lending institutions, even those that specialize in student loans, do not find it financially viable to underwrite loans for applicants with a poor credit history. Q : If I have a bad credit report, will I be eligible for any type of private student loan? A : While it is unlikely that you will qualify for a student loan if your credit history is poor, you may wish to submit a loan application in order to gauge the lender’s response. If you do not qualify for the loan on your own, ask the loan officer about the possibility of engaging a cosigner with acceptable credit as a way to secure the necessary loan. Most banks will allow cosigners, usually a parent or guardian, to sign on as a guarantor of the loan. Q: It seems that a student loan is like any other loan when it comes to credit history and acceptance. Are there any programs for people with bad credit who want to further their careers through education? A: Unfortunately, private lenders treat student loans just like any other type of personal loan. Applicants with a poor credit history are unlikely to be approved for any loan, whether they are first time college students or returning to college for career training. Again, cosigners present a viable option for students who find themselves in these circumstances. Q : If I fail to qualify for a private lender loan can I still apply for a Federal student loan? A : Federal Direct Student Loans are available to all students, regardless of credit score, as long as they can demonstrate the requisite level of financial need. The only exceptions are Federal Direct PLUS Loans for Parents, and Federal Direct PLUS Loans for Graduate and Professional Degree Seeking Students which, like private loans, require a solid credit history for approval. Students are advised to apply for all possible Federal loans before considering any private lender loans. Q : What should I look for in a private lender student loan? A : All private lenders have different loan criteria, and offer different loan options. Private lenders are competing for customers in a crowded marketplace. Consequently, many offer incentives to attract borrowers. These can include no-fee loan applications, low interest rates, and loan deferment options. Many banks and private lending institutions will also waive any penalties on early repayment for students with acceptable credit histories. To secure the most cost effective private loan, you will have to investigate a variety of lenders and compare the options that are available to borrowers with your credit score and income level. Due diligence is the key, and students should only sign a loan agreement when they are certain they have secured the best loan at the best terms. Private lender loans play a key role in helping students fund their college education. However, students should understand that all loans carry a significant amount of risk. Before signing any loan agreement, be sure that you fully understand all of the terms and conditions of the loan, and that you have a plan in place for the full repayment of that loan.